The American Romney traces its beginnings to the marshy area of Kent in England. Its origin lies with the old, established dual purpose Romney Marsh breed which was improved with Leicester blood in the nineteenth century. Often swept with harsh winds and heavy rainfall, the Kent landscape is abundant with lush forage. These geographic and climatic conditions have led to the development of some specific characteristics in the Romney breed. 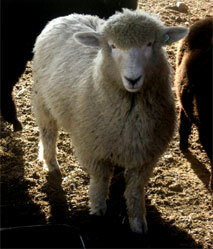 These traits include hooves that are resistant to foot rot and fleeces that remain healthy in harsh weather. Due to the similar land topography and weather conditions, the Romney breed made an easy transition to New Zealand and the Falkland Islands, where it became quickly established and still remains the predominant breed. In 1904, William Riddell and Sons of Monmouth, Oregon, imported the first Romneys to North America, where their popularity increased rapidly. The American Romney Breeders Association was founded in 1912 by Joe Wing, a world traveler and a great judge of sheep. At one time with the University of California, he was an early secretary of the ARBA, and his expertise was instrumental in the development of Romneys in America. The present-day American Romney is a product of English, and more recently, New Zealand blood lines, which have enhanced the progress of the breed, and helped maintain a diverse gene pool within North America. The first purebred natural colored Romneys were registered by the Association in 1972 by Morris Culver of Curtin, Oregon. In the last three decades, the popularity of Romneys has spread from the West Coast across the nation. With much recent growth coming in the middle and eastern states, the Romney has become a national breed.